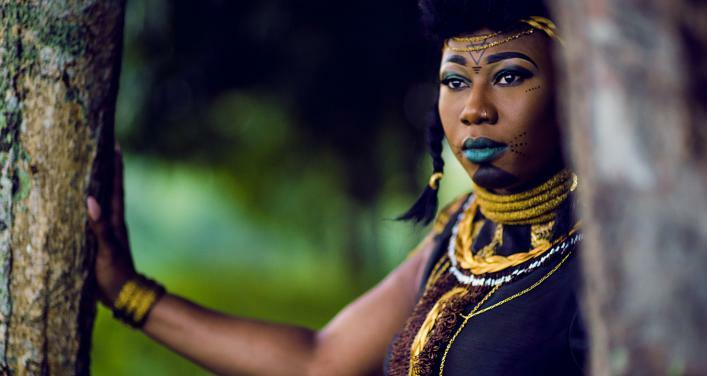 Descendant of a family of griots, Djely Tapa is the daughter of Kandia Kouyaté, one of the greatest voices of Mali, and Djely Bouya, dancer and legendary singer. From an early age she sings, dances, tale and entretains marriages and baptisms. Upon her arrival in Montreal, in Canada, Djely Tapa integrates quite naturally the artistic world from Quebec and so since 2004 we see her on the stages of various festivals, from Nuits d’Afrique to Francofolies of Montreal, and even to Harbourfront Centre in Toronto. In addition to the mission of protecting the culture and the Mandingo history, the role and the mission of the griot also is to pass on and to teach the values of courtesy and respect for loyalty while amusing her public with the music. Djeli Tapa has for vocation to commit the griotic tradition inherited of her family, and her music merges with several tones so modern, classic, urban, oriental … The reach of her voice and the lively energy of her dance steps leaves nobody indifferent. While on stage Djely Tapa sings in different tongues (malinké, bambara, kasonké, French and English) and she is accompanied by Diely Mori Tounkara with his Kora, Assane Seck on the guitar, Donald Dogbo on the percussions and Carlo Berri on the bass. With Djely Tapa, the emotion, the heat, the pleasure, the happiness and the atmosphere are there!